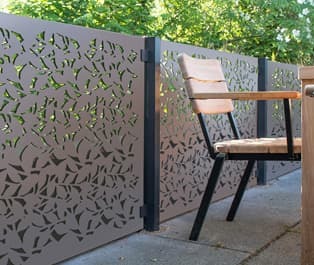 Decorative privacy panels and screens are strong, long lasting, affordable and truly beautiful, requiring practically no maintenance and will out last traditional wooden fencing, providing a stylish and practical fencing or balustrade infill for gardens, exteriors and interiors. Panels are made of either weathering steel, which is available pre-weathered or in a natural ´raw´ finish, or in powder coated aluminium. 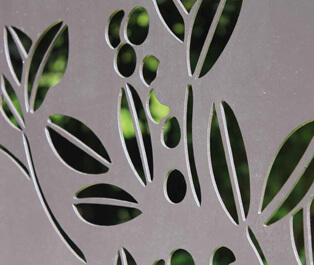 Panel designs are laser-cut and de-burred for consistency, precision and safety. 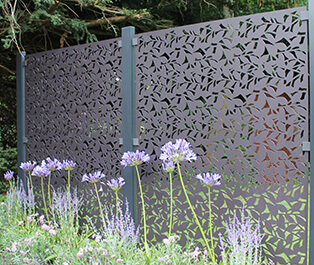 These strong, long lasting, affordable and beautiful screens and panels are practically maintenance free, providing a durable choice over wooden fence panels. 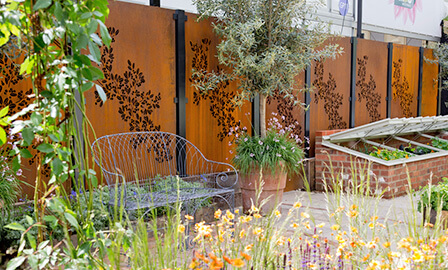 Weathered steel panels are made from corten steel; it rusts beautifully and improves with age. 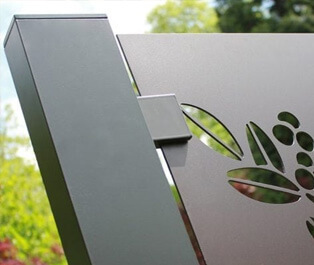 Aluminium panels are sustainable, made from recycled material with a high quality powder coated finish to protect from outdoor elements. The panels are affixed by steel clamps to aluminium posts, which should be set in concrete, just like traditional fence posts. Aluminium's resistance to corrosion, and the inherent strength of their box-section construction means that these posts will stand the test of time. 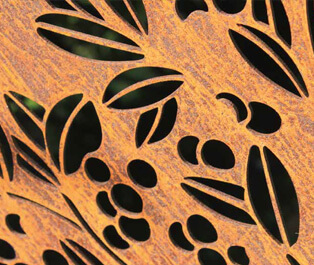 All decorative garden screens and fittings are designed here in Britain by Stark and Greensmith and manufactured from recycled materials. Stark and Greensmith are constantly working with UK garden designers and landscapers to bring you the most innovative garden screening products on the UK market. 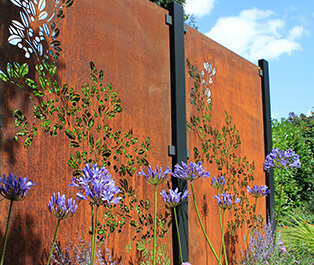 Garden designers, horticulturalists and landscapers have embraced corten steel as the untreated surface sits beautifully in natural landscapes providing a enhanced background for any garden. 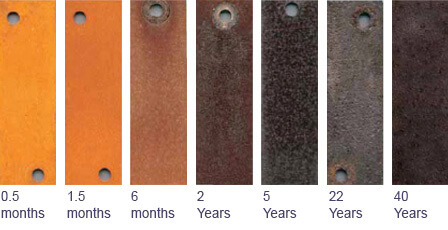 Also known as weathering steel, corten steel will form a stable rust-like appearance over several years of exposure to weather, gradually changing colour over time. Perfect for screening and delineating outdoor spaces and can also be used as a boundary fence. Supplied as standard width: 1190mm, height: 1780mm, thickness: 3mm. Ideal for delineating outdoor spaces, zoning seating areas, hot tubs, raised decks and terraces. Available in a range of sizes, all with a thickness of 3mm. If you have a project, from a single feature panel for the garden to panels for an entire development, or anything in between, please get in touch, we can work with you to design, fabricate and install your ideas so that they are fully resolved and compliant, on time and on budget.